Research. 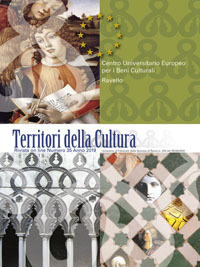 It is promoted and carried out by the Centre itself, thanks to a relevant contribution of external researchers. Therefore seminar exchange of views and result evaluation meetings are very recurring. Education courses. They are reserved to a strict number of persons who are carefully selected, they are carried out in permanent schools, within specialized courses or during masters, according to a form, that next to theoretical lessons, schedules research and experimentation periods. Publications. Tens of volumes - specifically published in editing collections - gather meeting and course acts. Actions on the territory. The Centre renders its services to the community. Particularly relevant is the Management Plan of Unesco Costiera Amalfitana site. On the left the list of the activities carried out by the Centre divided according to the different activity lines.